Bed bugs are by nature difficult to see because they hide during the day and they hide in just about anything. Cracks, crevices, suitcases, furniture, clothing, pillows, boxes. This makes bed bugs very easy to transfer from one location to another. Once bed bugs get established they are very difficult to eradicate because the produce rapidly and spread quickly from room to room in your house. Prevention is the key to bed bug control. Once bed bugs become established, insecticides are not always effective, and some bed bug populations have even developed resistance to insecticides. This makes bedbug extermination more difficult to do yourself. A professional pest management company can inform you about the best bed bug treatments for your situation. Bed Bugs are small, nocturnal, wingless insects belonging to the family Cimicidae. They are oval and flat in shape. Adults are dark brown to burnt orange in coloring while babies are more translucent becoming darker with age. Adults grow to approximately 1/4 inch. Bed bugs are hematophagous (bloodsucking) insects. Since nocturnal, they usually feed at night. They feed on humans and other warm blooded hosts such as rabbits, rodents, and even birds. Bed bugs preferred habitats are the human home. Their flat shaped body allow them to hide in tiny nooks and crevices. They can be found in mattress seams, bed frames, sheets, furniture, outlet plates, sofas, chairs, and other soft furnishings. 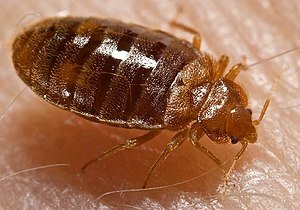 Bed bugs are often brought into your home on luggage from a vacation, second hand furniture, and can travel from adjacent apartments through hollows in walls. Bed bugs are mainly active at night and usually feed every five to ten days. However, they can survive for months without feeding. Bed bugs can reproduce and multiply extremely fast. Bed bugs most quickly reproduce in normal room temperatures (between 70 degrees and 82 degrees). Females can lay one to five eggs a day and up to 500 eggs in her lifetime. Her offspring can reproduce within a few months increasing the infestation population significantly. Adult bed bugs can live up to 500 days even without feeding. Take off shoes before you enter your home and ask guests to do the same. Bed bugs are known to travel on shoes and lay eggs there as well. Don’t use dust ruffles and bed skirts. They may look nice but they provide excellent hiding places for bed bugs as well as an easy way for them to travel up into your box spring and mattress. Keep at least two inches between the headboard of your mattress and the wall to make it more difficult for the bed bugs to access your bed. When you travel, inspect your hotel room for bed bugs so you don’t accidentally carry any home with you. There are special products available to protect you and your belongings from bed bugs when you travel. If you find bed bugs in your home there are some things you can do to get rid of them. Spraying bed bugs with rubbing alcohol will kill them immediately. Use a dish brush to kill all visible eggs and then call a bed bug exterminator. Heat or steam will also kill bed bugs and their eggs. If you affected linens bag them and launder in 120 degree water or hotter. If items cannot be laundered, bag them and set them out in the sun for several days. Monitor the temperature so it reaches a minimum of 120 degrees in the centermost area of the affected item. The best solution is to call us so we can implement integrated pest control management as part of treating bed bugs in your home. We suggest you contact us right away at 561-248-4546, or complete our contact form if you discover an infestation of bed bugs in your home. We provide safe, effective bed bug extermination, including bed bug heat treatment, for your problem without using any harmful insecticides inside your home.